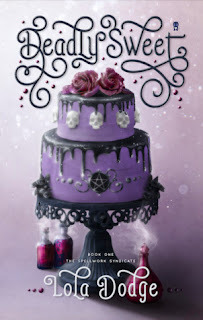 For fans of Hex Hall,The Magicians, Practical Magic, and Food Wars! Anise Wise loves three things: baking, potion making, and reading her spell books in blissful silence. She might not be the most powerful witch in the suburbs, but enchantment is a rare skill, and her ability to bake with magic is even rarer. Unfortunately, witches have a bad rep, and Anise’s dream of attending pastry school crumbles with each rejection letter. Then her great aunt Agatha pops out of the woodwork with a sweet offer. If she signs on as Agatha’s apprentice, Anise can have all the training and ingredients she’s ever imagined, and she’ll inherit the family bakery. The catch? Studying with Agatha means moving to Sedona—a dangerous otherworldly power center where her aunt is a key player in the magical community’s shady dealings. And the last apprentice? Assassinated. Now Anise is next on the hit list. If she can’t find and stop whoever wants her dead, she’ll be more toasted than a crème brulee. Deadly Sweet is the first novel in the Spellwork Syndicate series. It is a story about a young witch who wants nothing more than to attend college and become a pastry chef. I thought it was a really cute story with a nice magical touch. I would have loved to experience a little bit more of the magical world, but it was still thoroughly entertaining. The novel was a little on the short side, but I enjoyed that because I thought all of the information included was pertinent and not too much fluff. The story was slightly predictable, but it was really cute and I didn't mind that I could figure out most of the mystery before it occurred. I loved Anise's character and I really enjoyed the fact that she was pretty ordinary. Yes, she was a witch, but she wasn't a prodigy or princess. She was just a young girl who wanted to live a somewhat normal life as a pastry witch! Overall, Deadly Sweet was a fun and entertaining read. It was straightforward and had steady pacing with interesting characters. I would recommend this novel to readers who enjoy YA fantasy. I look forward to reading the rest of the books in the series when they are available. Thank you to the publisher and NetGalley for sending this novel in exchange for an honest review.